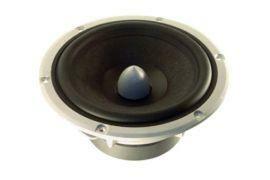 HDS-series woofer with 6½-inch (165 mm) Nomex cone. Peerless HDS-P830883 employs powerful ferrite motor with aluminium shorting ring, die cast aluminium basket and phase plug for low compression and frequency response shaping without the use of a dust cap. Note: additional manufacturer's item name for Peerless P830883 - AULY01608-0009.